The Metrodome housed two Final Fours, in 1992 and 2001. MINNEAPOLIS — Vikings, Twins, Gophers — all have their firm place in Metrodome lore. But the concrete sports shelter on Kirby Puckett Plaza, which will be a mausoleum after Sunday’s Vikings finale, then rubble by the end of January, served more than just its primary tenants. The Dome played host to outside spectacles of sport and beyond, including the crowning of champions and the tours of legendary musical artists. 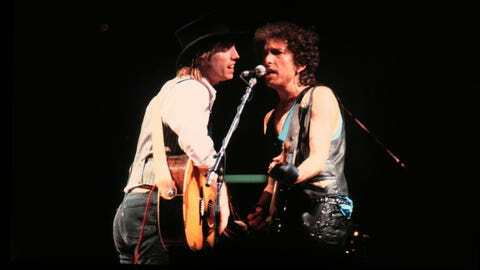 As the curtain on the 31-year-old venue’s lifespan draws to a close, it’s worth recalling some of the other notable events to pass through her gray, cement gates. The only Super Bowl in Metrodome history featured a 37-24 Redskins victory over Buffalo for their third NFL championship. The game itself wasn’t anywhere near as close as its final tally appears to indicate. Washington — "Hogs" offensive line, opportunistic defense and all — outgained the Bills 417 yards to 283, sacked quarterback Jim Kelly five times and intercepted him four times, and took a 24-0 lead in the third quarter on one of two short Gerald Riggs rushing touchdowns. Unheralded Redskins quarterback Mark Rypien completed 18 of 33 passes for 292 yards and a pair of scores en route to MVP honors, becoming the third different quarterback under coach Joe Gibbs to win a Super Bowl. It was the second of four consecutive title-game losses for Buffalo. 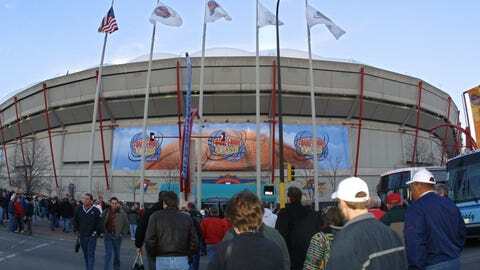 The Dome hosted two different Final Fours, in 1992 and 2001. The first saw Duke beat Michigan’s Fab Five — then freshmen — by 20 in the national championship game, concluding an otherwise-riveting 1992 NCAA men’s basketball tournament. The Blue Devils had defeated Kentucky on Christian Laettner’s famous turnaround shot just to reach the Final Four, where they edged fellow traditional powerhouse Indiana 81-78 then trounced Michigan two days later. The Wolverines defeated dark horse Cincinnati 76-72 before falling in the first of two straight national title game defeats. They later vacated both their runner-up finishes as part of harsh penalties stemming from a recruiting scandal involving Ed Martin. Duke also claimed victory in the 2001 Final Four, handing Maryland a 95-84 loss then besting Arizona 82-72. The Wildcats had trounced Michigan State in the tournament semifinals but fell victim to a Blue Devils team that won two of its four NCAA crowns inside the Metrodome. In its fourth year of operation, the Metrodome welcomed Major League Baseball’s top performers for the 1985 All-Star Game. Cardinals outfielder Willie McGee and Phillies catcher Ozzie Virgil each drove in a pair of runs, and San Diego’s LaMarr Hoyt and Houston’s Nolan Ryan pitched three innings apiece in a 6-1 National League victory. The contest featured legendary MLB names Tony Gwynn, Darryl Strawberry, Ozzie Smith, Rickey Henderson, George Brett and Cal Ripken Jr., to name a few. Outfielder Tom Brunansky was the only active Twins player named to the American League roster, but past/future Minnesota stars Jack Morris (1991) and Burt Blyleven (1970-76, 1985-88) both pitched in the contest. Target Field, the Twins’ digs since 2010, will become this summer the third Twin Cities venue to host the Midsummer Classic; the All-Star Game was played at old Metropolitan Stadium in 1965. While original owners Marv Wolfenson and Harvey Ratner oversaw construction of the Target Center, the Timberwolves called the Metrodome home for their inaugural season, 1989-90. The first NBA team in Minnesota since the Lakers left in 1960, the Timberwolves finished 22-60. But the prospect of top-level pro hoops and the likes of Tony Campbell, Tyrone Corbin and Pooh Richardson brought out unprecedented crowds. Minnesota set an all-time NBA attendance record with 1,072,572 fans — an average of 26,160 per game — and on April 17, 1990, the third-largest crowd in NBA history (49,551) watched them lose 99-89 to the Nuggets. That would be the Timberwolves’ final clash in the Metrodome, as they moved into their permanent home before the following season. When the Metrodome first opened, the Minnesota State High School League moved its state football championships indoors and rebranded them as the Minnesota Prep Bowl. The switch rendered the Dome the coveted Thanksgiving weekend destination for every title-aspiring high school program in the state. The next three decades provided some highly memorable moments, including New Prague’s 1985 defeat of Mora on a punt return touchdown with 74 seconds remaining, Blaine’s last-second edging of Cretin-Derham Hall in 1988 and Mahnomen’s four consecutive titles from 1990-93. Eden Prairie, Owatonna, Hutchinson, St. Croix Lutheran, Chatfield, Mahnomen and Grand Meadow claimed crowns in the Prep Bowl’s final go-round at the Metrodome last month. Like the Vikings, the state football championships will move to the University of Minnesota’s TCF Bank Stadium the next two seasons, then shift back indoors once the NFL team’s new venue is completed. — Special Olympics: The Special Olympics took place at the Dome in December 1986 and July 1991. — Concerts and entertainment: Big rock acts, pop icons, extreme sporting events and trade shows all came through the Metrodome during its existence. Musical artists included Pink Floyd, the Rolling Stones, Paul McCartney, U2, N’Sync, George Strait and members of the Monsters of Rock Tour. A handful of motocross and snocross competitions were also held at the Dome. In addition, it was a primary destination for auto, camping, home and boat shows, especially in the late 1980s and early ’90s. — Rollerdome: From 1990 on, the Metrodome concourses were open to the public for roller skating, running and walking. — "Little Big League" filming: In 1993, moviemakers filmed "Little Big League" — a PG-rated picture about a young boy who takes ownership of the Twins and names himself manager — in Minneapolis and, naturally, concentrated much of their shooting within the Metrodome’s walls.